How did A Christmas Carol change the English language? Charles Dickens' A Christmas Carol (1843) introduced many memorable words, phrases and idioms into the English language. It also popularised the greeting 'Merry Christmas' which was not widely used at that time. Stave One is a particularly rich source of memorable phrases. Bah Humbug! interjection. An exclamation of irritation or disgust. Dead as doornail - obviously/conclusively dead. Gruel - a thin liquid food of oatmeal - used to refer to cheap/poor food. Scrooge: noun. Someone with cold/mean/miserly attitude. Also someone who transforms from bad to good. Marley was dead, to begin with … Old Marley was as dead as a doornail. The cold within him froze his old features. No warmth could warm, no win-try weather chill him. 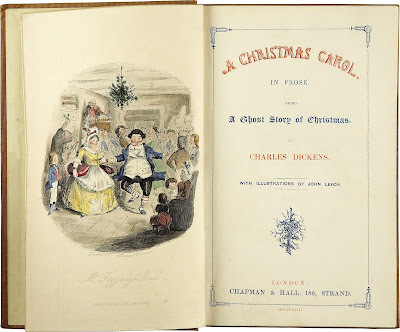 More quotations and on Dickens and Christmas here.